Yesterday me and Kyle went to see Star Wars at The Film Forum in New York. 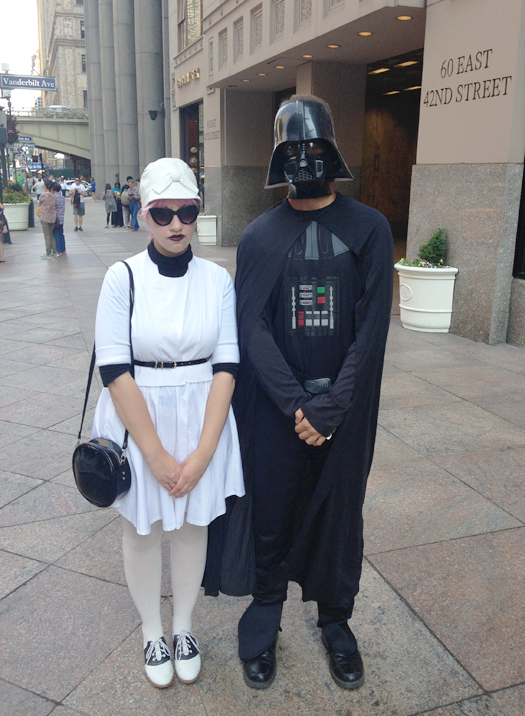 He dressed up like Darth Vader and I did my best impression of a 1960's storm trooper. I was originally trying to channel c3po with a gold glittery dress that's tucked away in my closet and hardly ever gets to see the light of day, but without any other accessories I just looked like I was going to a fancy party. After lots of last-minute closet rummaging I put this together and I was pretty happy with how it turned out! Once I stood next to Kyle... er.. Darth Vader.. 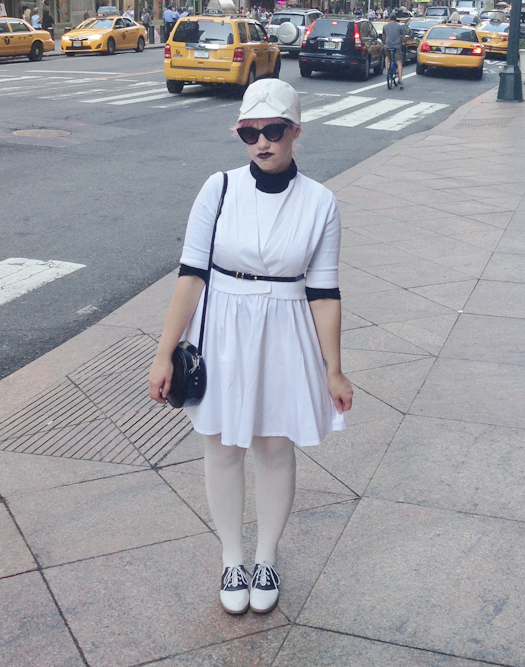 I think it was more obvious that I was supposed to be a storm trooper. It was really fun seeing Star Wars on the big screen. My experiences at the Film Forum tend to be really hit or miss. I'd say about half of the screenings I've attended have had wonderful, respectful audiences. When I went to see Dr. Zhivago two weeks ago you could have heard a pin drop in the theater. It was wonderful! When I saw the original Japanese Godzilla back in April, everyone was horribly disrespectful and kept laughing at things that weren't even remotely funny. If you've seen the Japanese version you know that it's a lot more serious and less B-movie than the American version. It didn't deserve that kind of reception. Star Wars fell somewhere in between. Obviously a lot of Han Solo's lines deserve a little chuckle, but people seemed to be laughing AT the movie, not at the funny lines in the movie (if that makes sense?) I mean serious stuff, like when poor little r2d2 is damaged towards the end. I thought Star Wars would have been immune from this kind of thing?? It didn't ruin the screening for me like the Godzilla audience did, but it was still really annoying. After the movie we decided to take advantage of Kyle's costume to get some photos around the city. We ended up walking to a lot of the major tourist attractions for a little series of Darth Vader going sight-seeing. 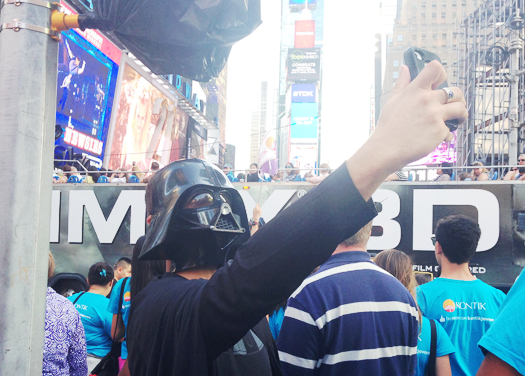 My personal favorite was his selfie in Times Square, ha!